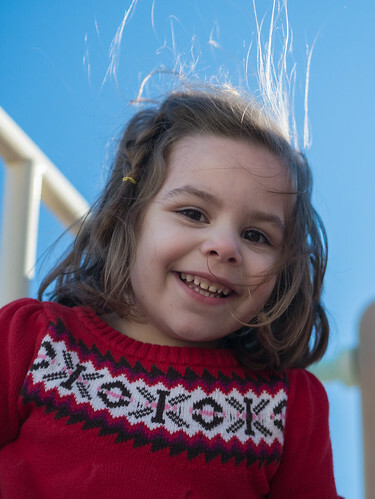 After so much snow and such extreme cold, this past weekend was incredibly nice with temperatures approaching 60. 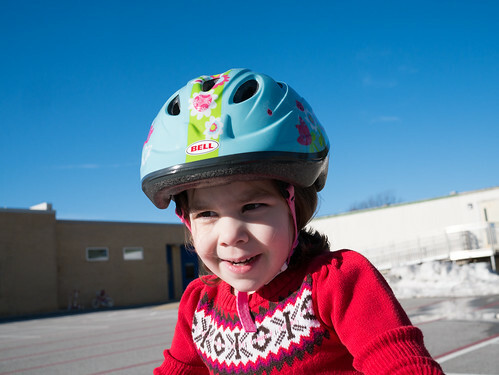 So we broke out the bikes and scooters and headed over to the blacktop at Molly’s school. 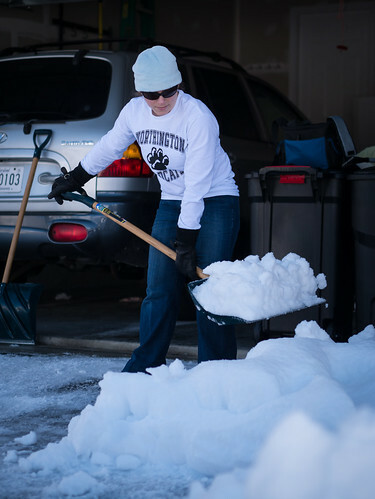 It was so warm that it melted the snow and ice, except for the stuff piled up on the side. 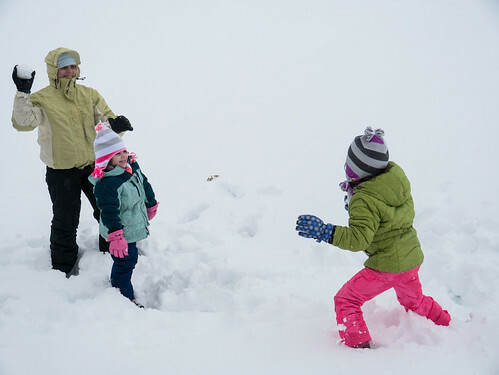 It felt funny to be playing outside in the warmth on a blacktop surrounded by large walls of snow. 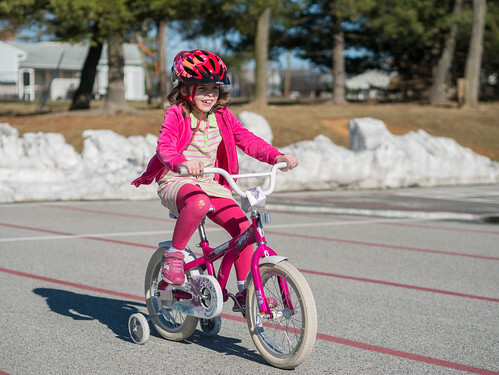 Leah was given this little bike by her friend Matilda last Fall, but didn’t get a chance to ride it before the cold. 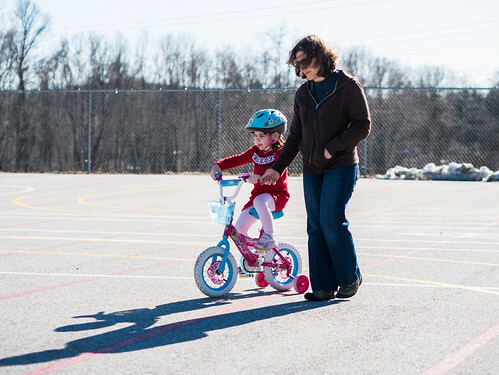 She wanted a little help at first since she had never really ridden a bike before, and Jen was happy to oblige. Eventually Leah was doing it mostly herself with Jen fading into the background. 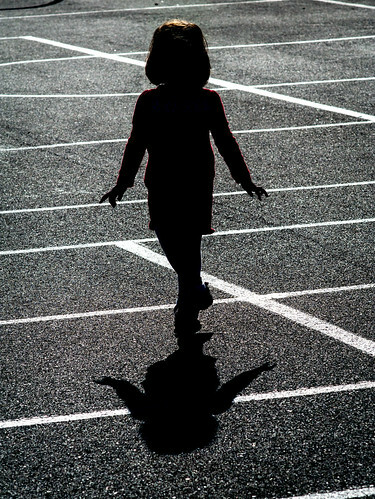 Leah in silhouette and shadow. I love her pose here. Makes her seem so much older than four. 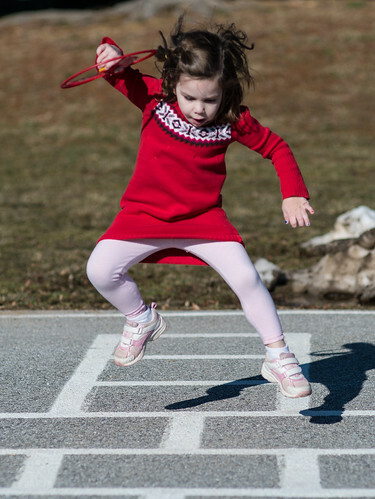 She's a hopscotch champion. 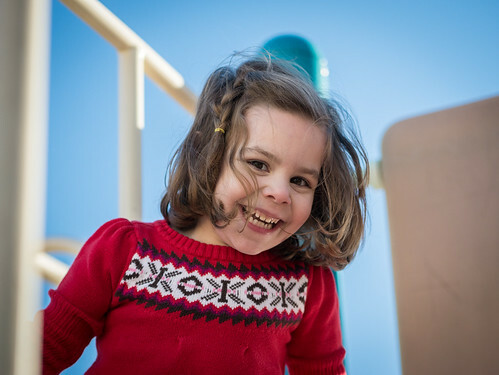 Leah may have a couple years before she’s in elementary school, but she’s already ready for recess. Please excuse the missed focus; she was moving very quickly. Molly found a bit of chalk and drew a little, then gave it to Leah. Leah was more into it and stayed focused on drawing for some time. 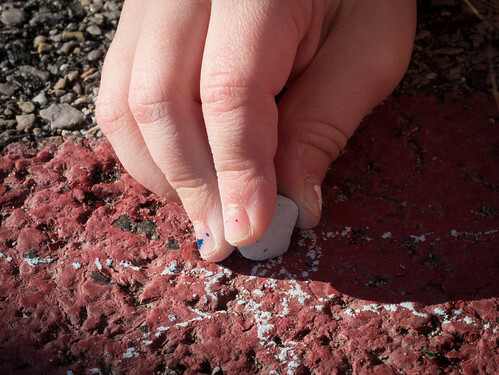 Leah’s drawing a sun here with her tiny remnant of chalk in her little fingers. Leah decided a fun game was to try to run into me with her bike. I had to snap this quickly before fleeing her attack. 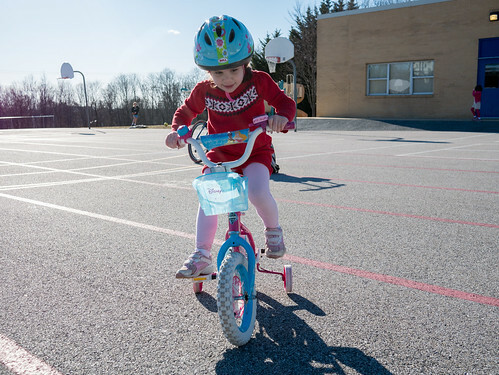 By the end, Leah was getting around on her bike pretty well. 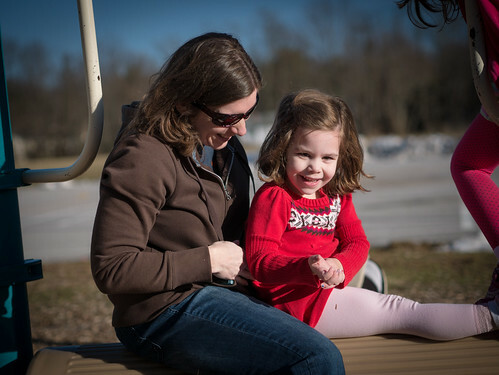 After an hour or so on the blacktop, we moved to the playground. 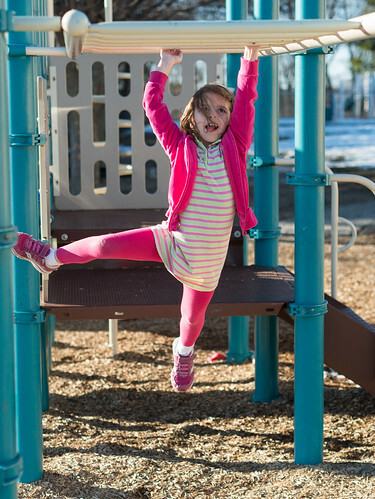 Molly’s love for monkeys has turned her into a master of the monkey bars. Note that proper swinging technique includes sticking out your tongue at all times, even if your hair is in your face. While these pictures may look like Leah is posing for me, she is actually trying to avoid my camera. 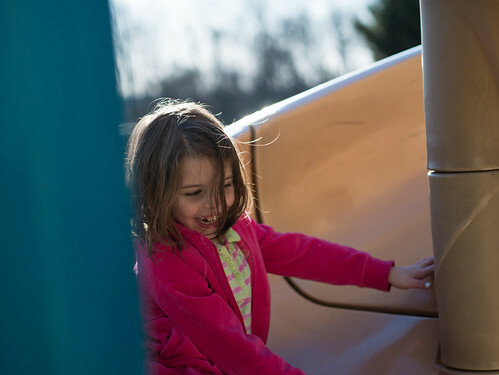 She would run by, briefly glance at me to taunt me, then disappear down the slide. Fortunately, I’m pretty quick and managed to catch her taunt a few times. 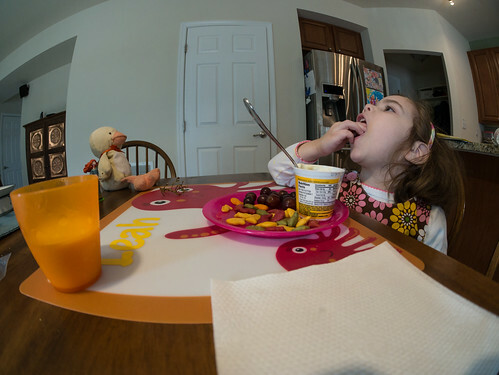 This time, Molly decided to help me by capturing Leah before she could run away from the camera. We very much enjoyed our day of fun in the sun. Of course, after our weekend of warmth, we've already had snow on Tuesday and Wednesday this week. Just 2 or 3 inches between the two days, but still a dramatic turn from our warm weekend. 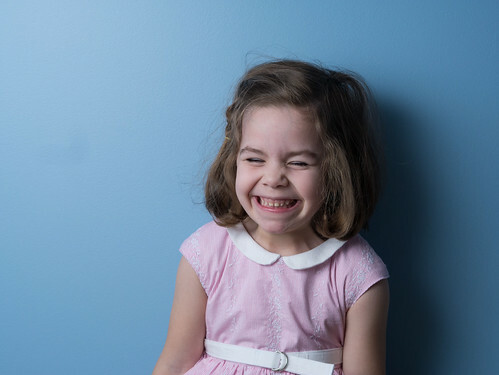 As Chad mentioned, Molly has requested an American Girl party for her upcoming birthday. 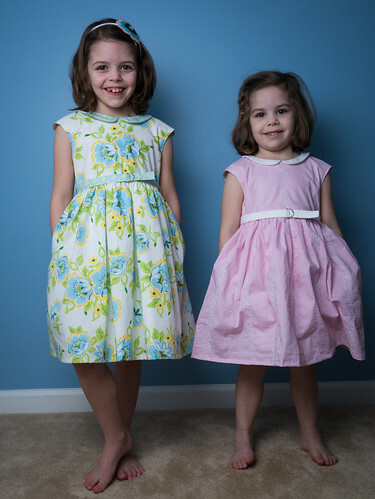 The girls asked if I'd make them new dresses for the occasion. 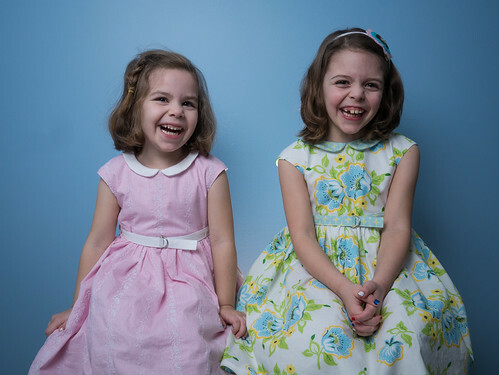 Molly picked the Caroline Party Dress for the tea party. 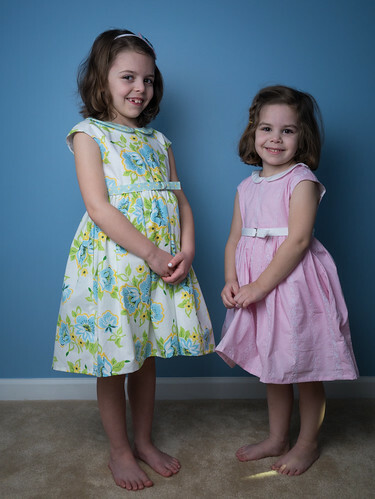 As requested, the dresses have pockets. Sometimes making up funny stories behind the camera makes for a funny photo shoot. 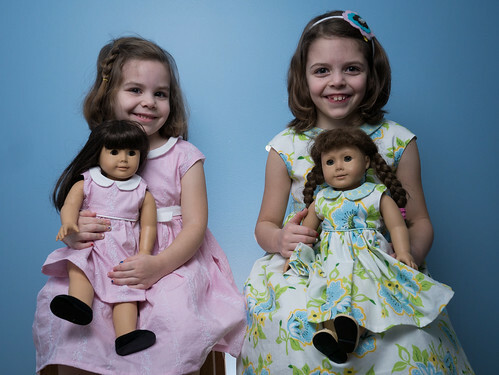 Of course, for an American Girl doll tea party, the dolls need new (and matching) dresses too. 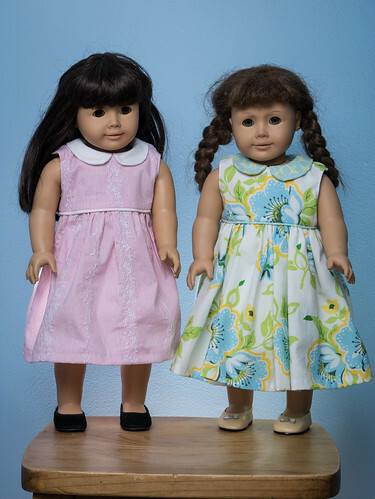 I had to get a little creative for these and modified the Mini-Miss Mary Mack doll dress to match. Saturday, Jen told Leah she had a surprise for her, and she needed to close her eyes. She’s a bit excited about it. 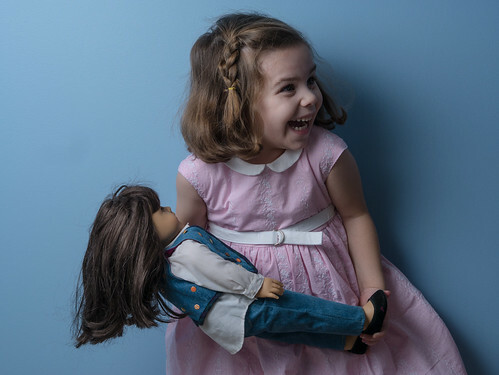 It’s her very own American Girl doll! 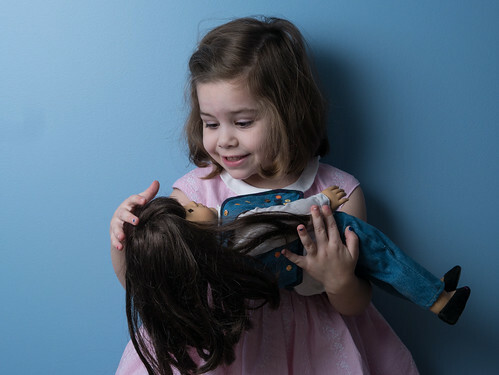 This girl loves her new doll. 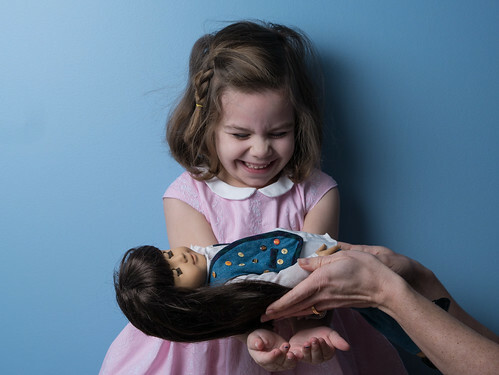 Jen’s been looking for an American Girl doll for Leah for some time, but she really wanted to find one before Molly’s upcoming American Girl birthday party. 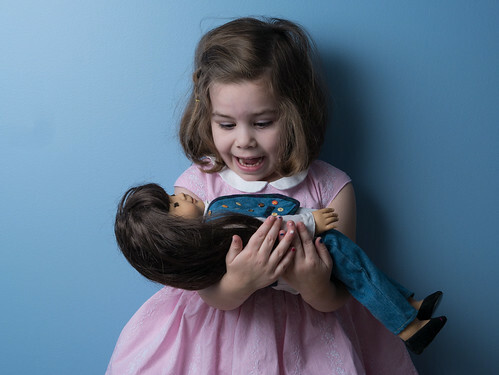 Jen found a friend who had this doll as a girl and had saved it for her daughters, but ended up having all boys. 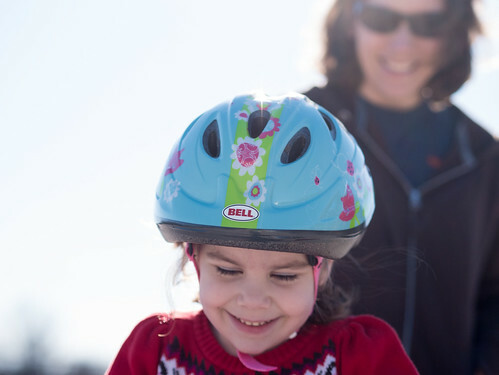 She was happy to pass it on to a little girl nearby, and Leah was happy to have her. Leah decided to name her Rose Jane McIntire. 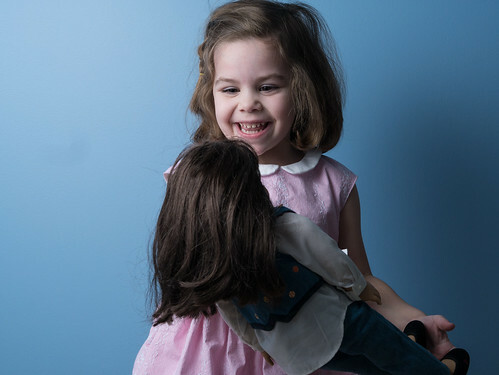 McIntire is the last name of Molly’s American Girl doll, and the girls have decided that Rose is her sister. The two dolls have been in constant use the past couple of days, and generally wear at least 8 outfits over the course of the day. 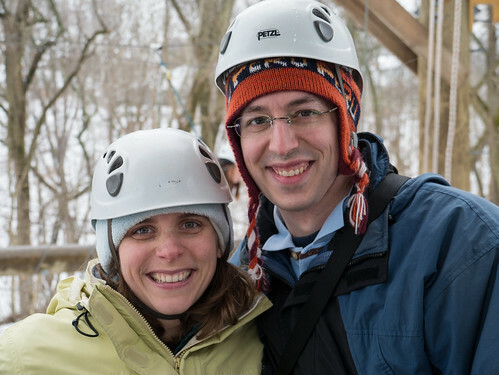 For Christmas, Jen gave me a Valentine’s Adventure at Terrapin Adventures. This is a special couples event they hold around Valentine's Day. 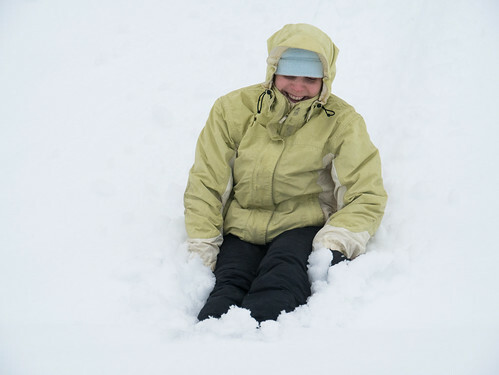 When she signed us up, she didn't realize we would have had three days of serious snow falling. It snowed again the morning of our adventure, but not heavily. It was forecasted to stop around the time we were set to start, but it didn't. Instead, we got a steady dose of light snow throughout our three hours outside. 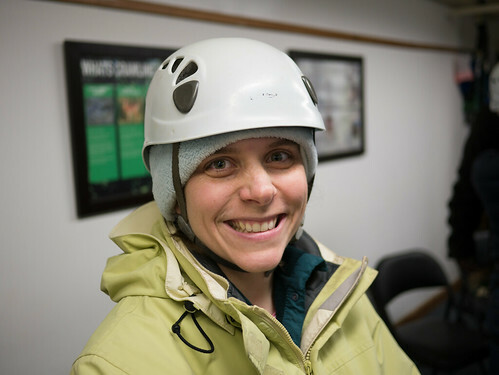 Jen’s suited up in her helmet and harness, ready to go. I'm especially proud of her for going, as she was not looking forward to being out in the snow and cold. And here we go. 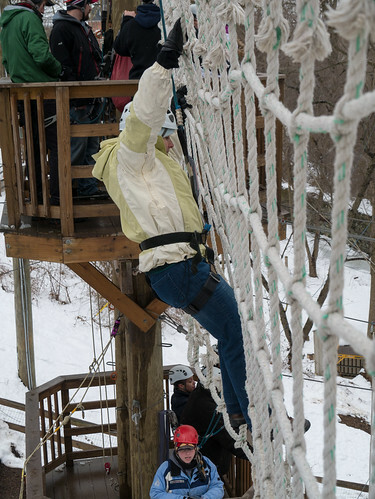 Jen’s up on the first level of the High Ropes Course, ready to go. Guess I need to get up the ladder. 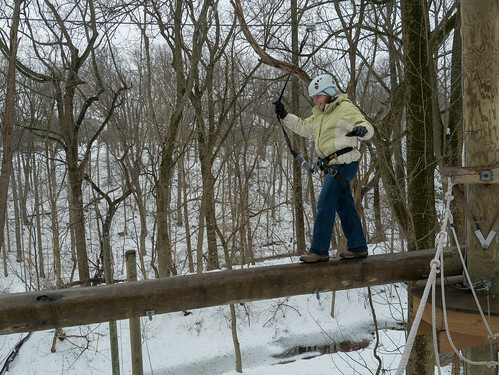 Here we are, up high on a ropes course as the snow gently falls. Not our typical date, but certainly very fun. 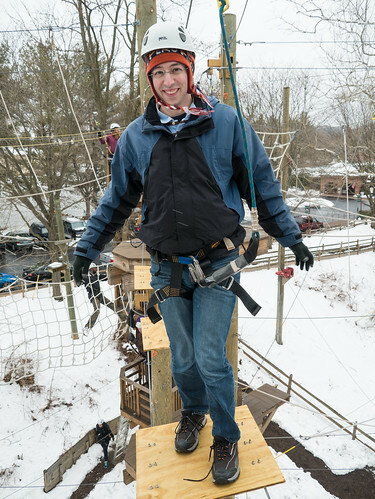 Climbing across the cargo net was a serious workout. 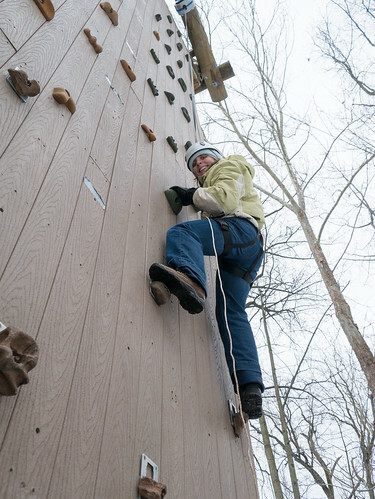 You get pretty high up on this course - about 40 feet off the ground. At that height, the wind can make the whole course sway, adding a bit of extra challenge to it. 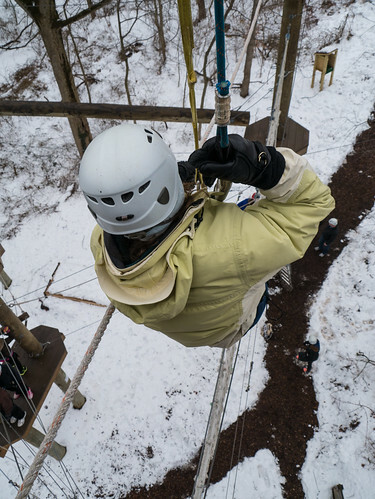 Carrying a nice camera around on a high ropes course can be a bit challenging, but Jen gave me a break for a bit of the third level. So, here I am hanging around way up high. Despite what it looks like, I don’t really have to pee. I probably should have double-knotted my left shoe. After the High Ropes Course, we went on the Giant Swing. It’s a 40 foot tall swing for multiple people. You’re pulled up by a winch, then chop a rope to swing. The initial drop was a lot more than I was expecting, and it made Jen a bit queasy. I still thought it was fun. I'm not so sure Jen would agree. 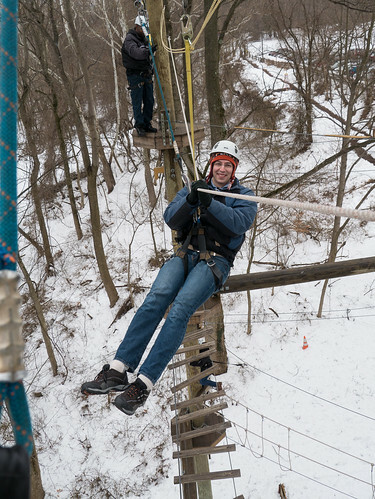 We then moved on to the Zip Line. I don't have any pictures of it, but it is featured in the video below. Our last stop (after the unpictured zip line) was the tower. We climbed a tiny bit, but we were both tired and our fingers were frozen from being outside for three hours. So, we headed in for some hot chocolate and Hershey’s Kisses. Pictures are nice, but if you want an idea of what it was really like, video is much better. Here's a taste of the fun. In addition to the fun activities, they held a raffle for a gift card to Rams Head Tavern and we won! 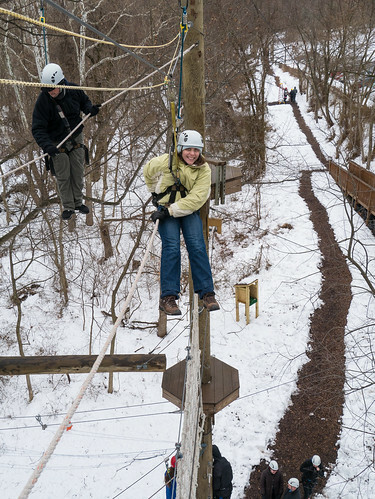 We were up on the second level of the ropes course when they shouted our names. The plan for the second half of our date was a bit more traditional - dinner out. We headed to RG's BBQ Cafe, a new restaurant that's supposed to be great. Jen had bought a Groupon for it and we were looking forward to checking it out. Sadly, it was closed. It should have been open, so we're not sure why it was closed. Our only guess was that it had to do with the weather. So, we turned around and headed back to Savage Mill to the Rams Head Tavern. Instead of using the Groupon, we used our newly acquired gift card to get a yummy dinner. 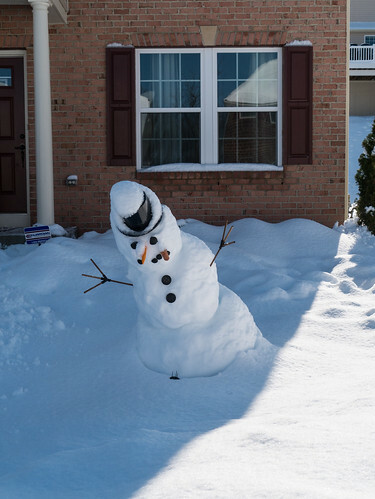 Olaf Frosty had a rough evening. First, it warmed up and rained in the afternoon meaning he melted a bit. This caused him to start to lean. Then the snow fell and the wind blew. Looks like he lost a button and a piece of his mouth. 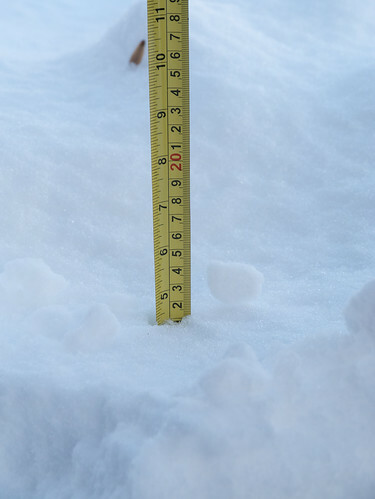 We got between 4 and 5 more inches (this is measuring on the driveway where I shoveled the day before). That said, the rain and warmth before the snow meant that yesterday’s snow was compacted enough that the total was still only about 11 inches deep. Just a much heavier 11 inches. Thanks to my outstanding wife, I was not shoveling all this snow alone. If you add the time we each shoveled together, we spent about nine man-hours shoveling this snow over the past few days. Yet again, I walked Molly home from a friend’s house and she chose to walk through the snow-covered back yards. On the walk home, she walked along the top of the hill while I was at the bottom. She chose to take advantage of her position to attack me with some snowballs. Once we got to our back yard, I told her it was time to walk down the hill. She chose to get down a different way. It snowed again the next day, but not enough to need to shovel. I am very thankful for this. We got a bunch more snow thanks to Winter Storm Pax. Yet another snow day off of school. At least it was only supposed to be a half day in the first place to allow for parent/teacher conferences in the afternoon. We stayed inside for the morning, but then ventured out after lunch. Molly was sinking into it immediately. 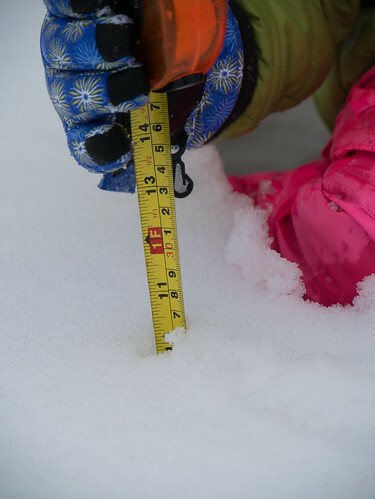 At that point, the snow measured a bit over 10 inches. The snow had been melting for most of the morning thanks to a temperatures around 35 and a pretty constant rain. Others around us got 14 inches, but that seems a bit more than what we saw at our house. Perhaps 12 inches at its deepest up to this point, though it's snowing outside as I write this so there will probably be more than that in the morning. Molly’s just chillaxing. You’d think she might be a bit chilly in her bed of snow, but it doesn't seem to bother her. 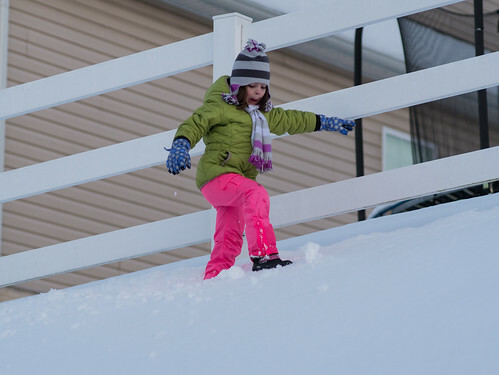 Her snow pants and coat must be doing their job well. 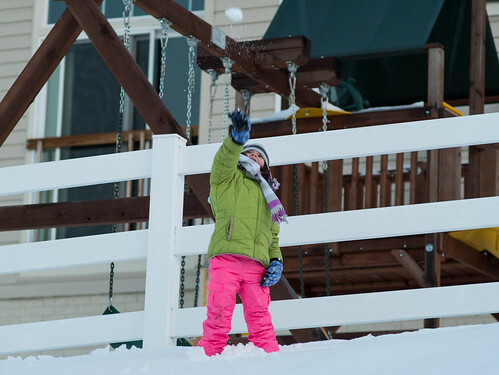 First things first - snowball fight! Hey, not at the camera! Why does everyone love to attack Daddy? 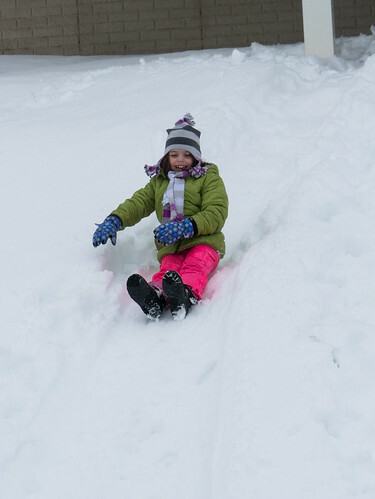 Unlike last time, Leah had a great time in the snow. I think she didn’t like the extreme cold of the last big storm. Today was 30 degrees warmer, which was much more pleasant. 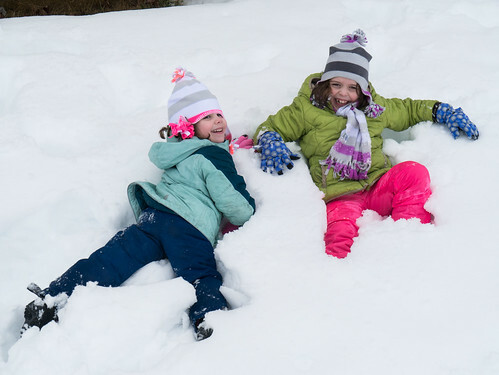 These girls really like just laying around in the snow. We got Jen on the sled this time. Here she is blazing the trail with the first sled run of the day. 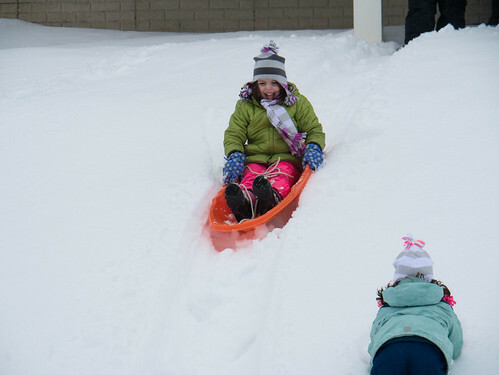 The snow was so deep and wet, the sled didn’t move very quickly. And the end of the run left Jen a bit buried. 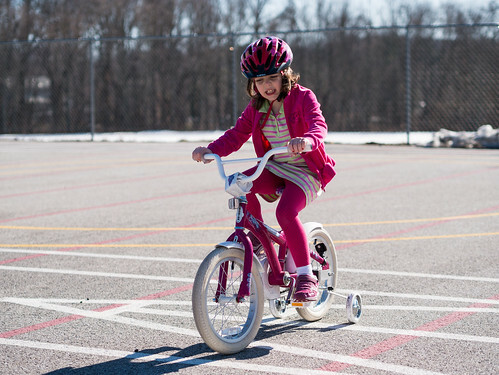 Molly got a bit more speed by using the track that Jen had just created. Molly also finished under the snow. 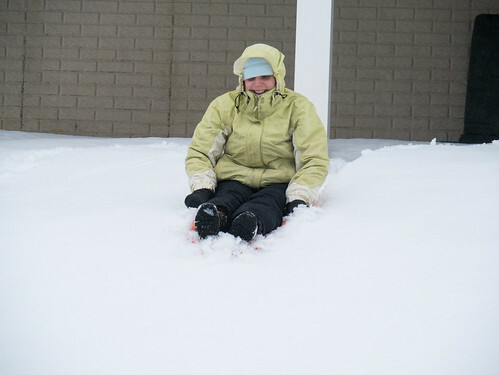 In fact, the sled seems to be wedged pretty deep in it. 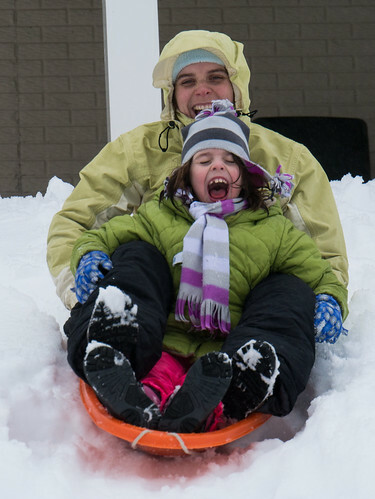 Leah was excited to sled with Mommy. 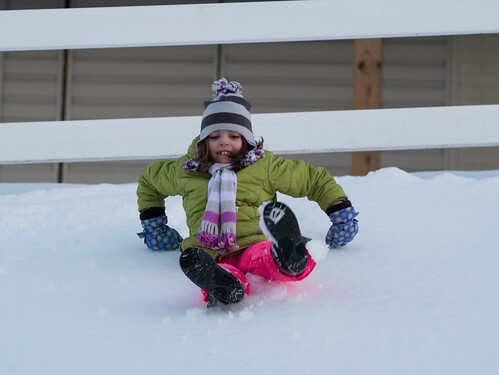 Who needs a sled? 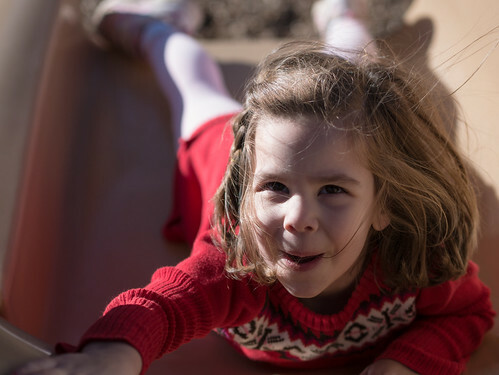 Molly can slide down pretty quickly without one. 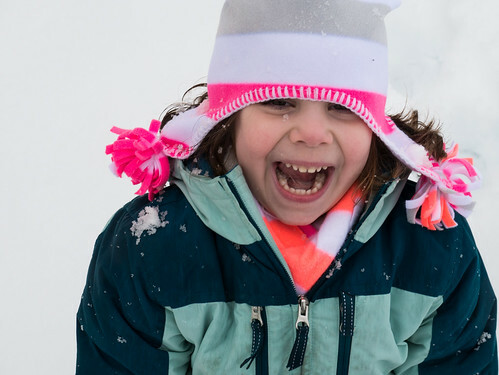 Molly was a bit excited to sled with her mom. After sledding, it was time to make a snowman. 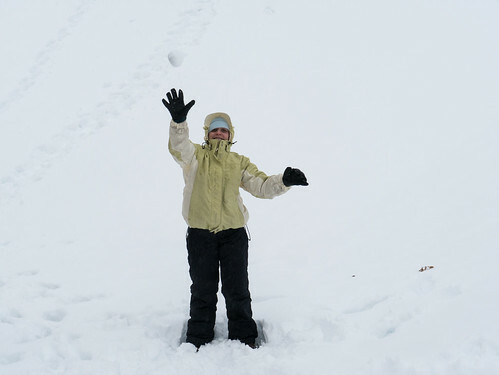 The snow was so wet you could roll a snowball around to create a giant snowball with ease. That is, until it got so big and heavy that it wouldn’t move. Leah’s giving it her best, but it’s not moving. 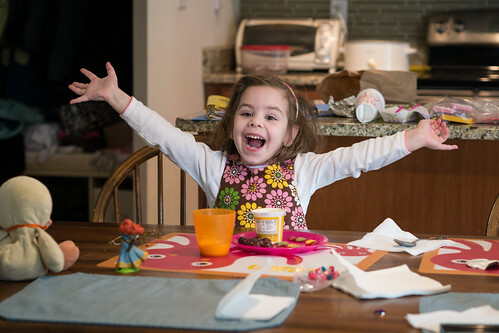 With a little bit of help from Molly, they managed to get the ball rolling again. Here’s our snowman. The girls named him Olaf Frosty Sellers. 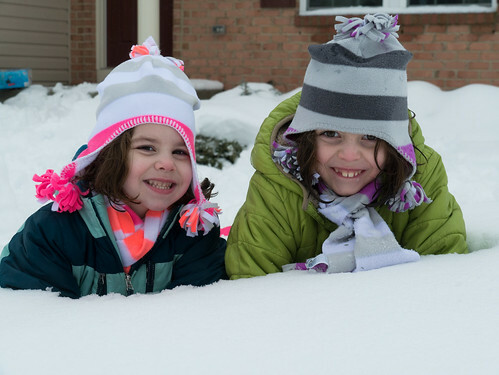 The girls love to eat snow. Looks like Olaf Frosty should watch his back. I think Olaf Frosty prefers this sweet kiss to being eaten. 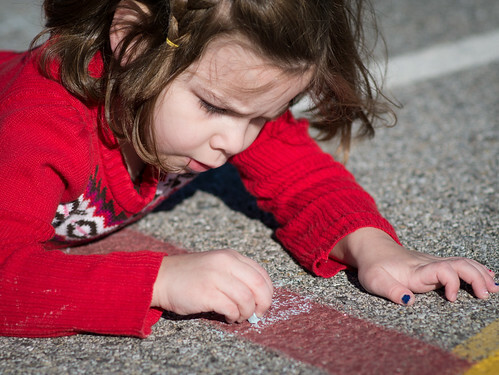 Making a snowman is hard work. Time for a rest. Where better to rest than lying down in the snow. We had a bunch of fun in the snow. Eventually the rain returned, so a good bit more melted and our snowman started leaning forward a bit. The rain turned back to snow about 4 hours ago, and the snow will likely continue for another couple at least. I'm not sure how deep it'll be in the morning, but I know it'll be extremely heavy to shovel. I'll get my exercise. Leah's preschool class has a class pet of sorts. Quackers the duck (on the left) gets to go home with each kid for a few days. 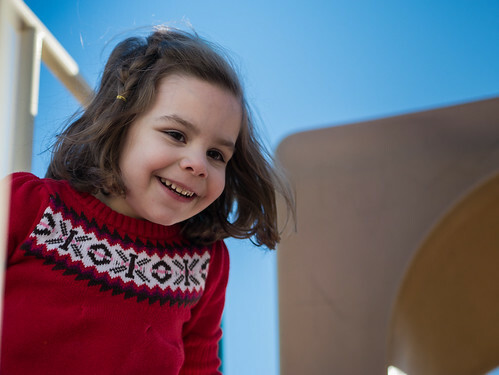 Leah was given instructions to take him on some adventures, and that's exactly what she did. Before getting to any adventures, they had lunch. 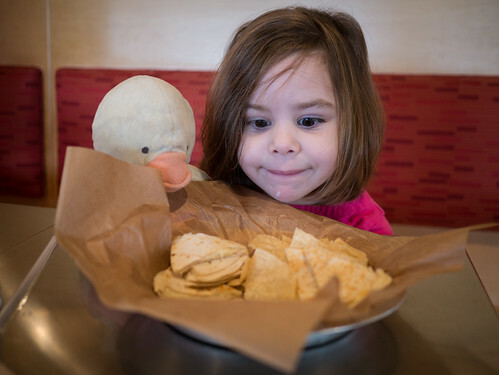 Quackers was very well behaved at the table. 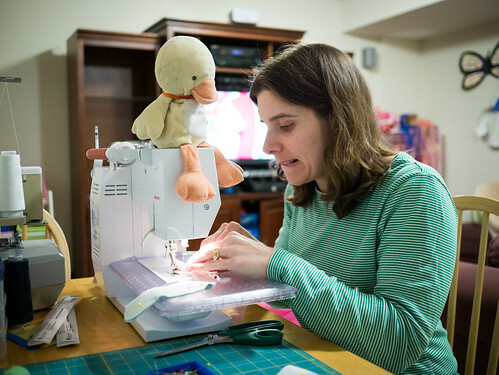 Quackers then helped Jen sew a dress for Molly. 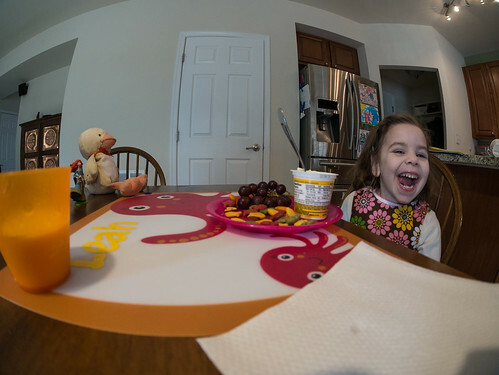 Leah was there too, but chose to leave the sewing to her mom and Quackers. Quackers was very excited when he found out we were having fish for dinner. 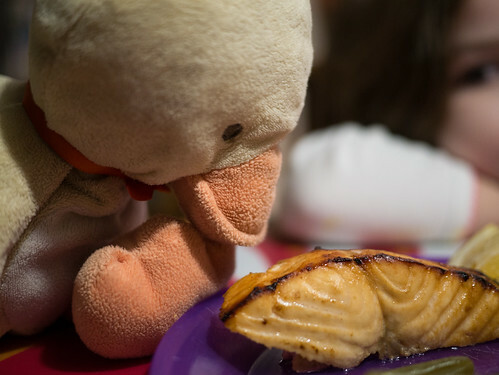 Quackers and I thought the salmon was excellent. 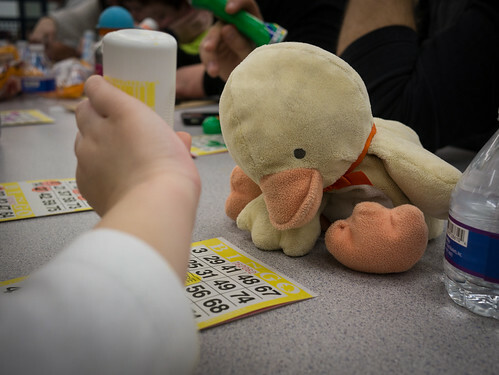 Quackers joined us for Bingo night. He and Leah are ready to play. 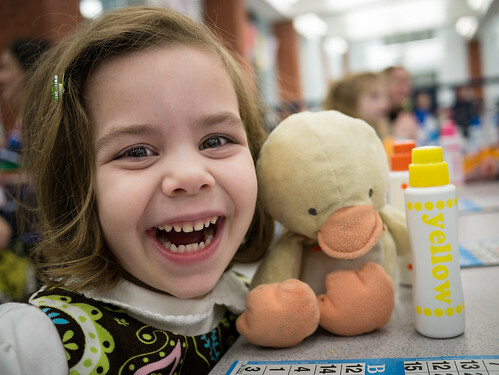 Quackers was extremely focused, ensuring that Leah never missed a number on any of her cards. This is one intense duck. 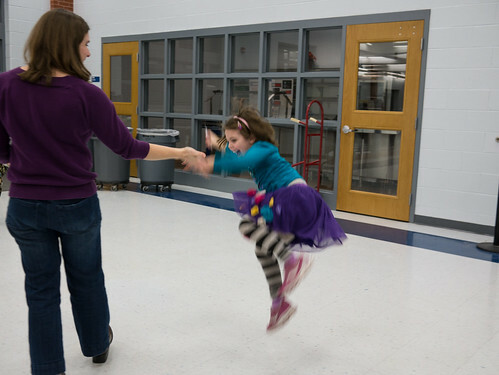 Leah and Molly had ballet on Saturday morning, which sounded like fun to Quackers. He didn't get to dance, but loved watching the girls. Generally our girls are not allowed to bring non-humans (toys, animals) to Sunday School, but since Leah’s assignment was to show Quackers some adventures, he of course came along. And he didn't have to worry about whether the teacher would allow a duck in the classroom, since Jen was the teacher. Looks like Quackers got his beak stuck in today’s Sunday School craft. After church we went out to eat at Qdoba with Grams. Quackers was very excited. I don’t think he’d had a quesadilla before. After lunch, we went to Target so the girls could spend the gift card they won in the Bingo night raffle. They got a couple small toys and a bag of Hershey’s Kisses. 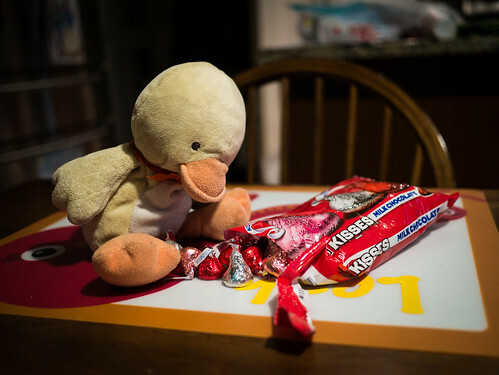 Shortly after we got home, I caught Quackers getting into the chocolate. You’ve gotta watch this duck closely. Quackers went with Leah to the gym to watch her show off her gymnastics skills. 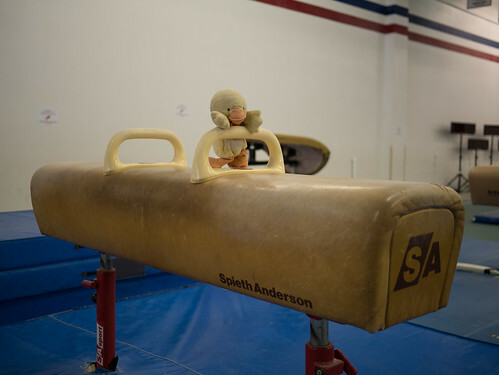 He loved watching her, but then snuck over to the pommel horse to work on his routine for the 2016 Duck Olympics. Quackers also got to get frozen yogurt with Mrs. Christy and Olive. He said it was a lot of fun, though he felt a bit weird getting frozen yogurt when it was so cold outside. Sadly, I don't have any pictures of that. The adventures were very fun, and Quackers was sad they had to come to an end. 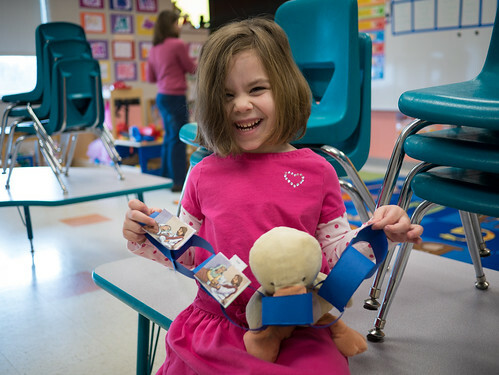 But, he was very excited to get back to school to tell everyone about all the fun he had with Leah. In fact, Leah and I made this story into a book that she brought to school so all the kids in her class could hear the story as well. 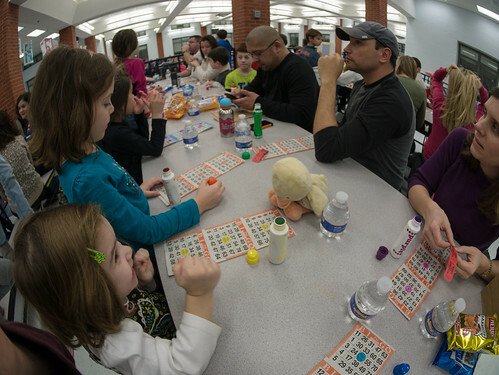 Molly’s school had a Bingo night for both kids and adults to participate in. Here’s a lineup of six first grade girls, and Leah at the end. They're all paying close attention to make sure they don't miss a number. There were lots of people at the Bingo night. In fact, there were so many that they had to hold it at a nearby high school instead of Molly's school as we needed more space. There was also a duck, but you'll have to wait until tomorrow to learn more about that. We have a winner! OK, she didn’t get Bingo. 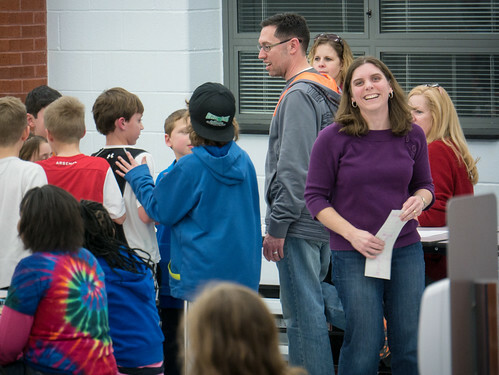 But, in between the Bingo cards they had raffle prizes, and Molly won a Target gift card. 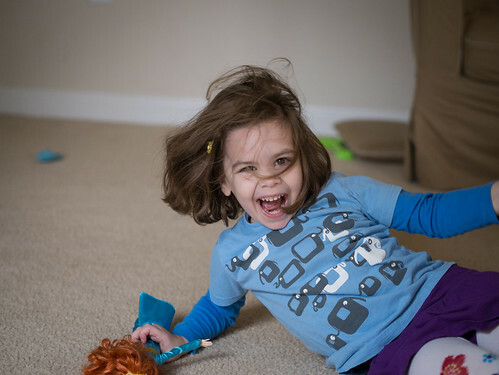 She was so excited she couldn’t stay on the ground, or stay still enough to be captured by a camera. She’s still running around in excitement from the raffle win. She'd better zoom back to the table before they start the next round of Bingo. Jen got Bingo! Unfortunately, so did two other people. In the Bingo-off, she sadly came up short of winning the scooter. 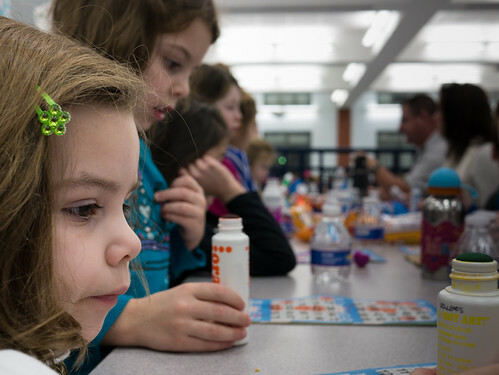 Who would have thought Bingo night would be such an emotional roller coaster? 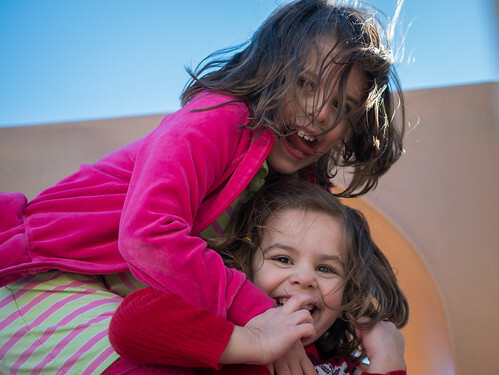 We saw Frozen in the theater and the girls loved it. They both claim it is the best movie they've ever seen. Since then they've kept singing the songs over and over again, so I bought the album. 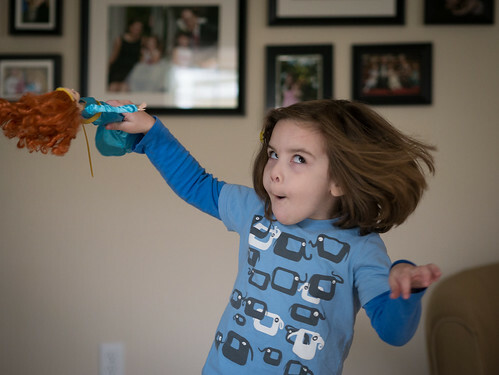 The next day, Leah decided to put her favorite song (In Summer) on repeat and dance with Merida. 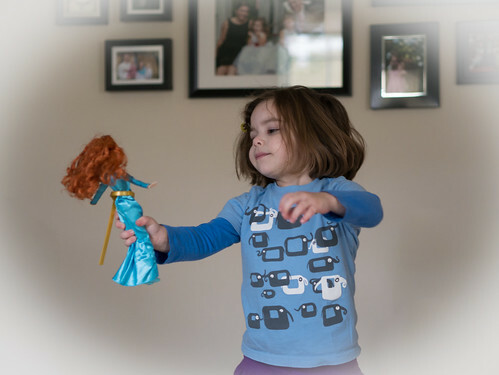 I’m sure she’d rather be dancing with Elsa or Anna, but we don’t have any Frozen dolls (yet?). This song is pretty silly, so the dancing had to match. 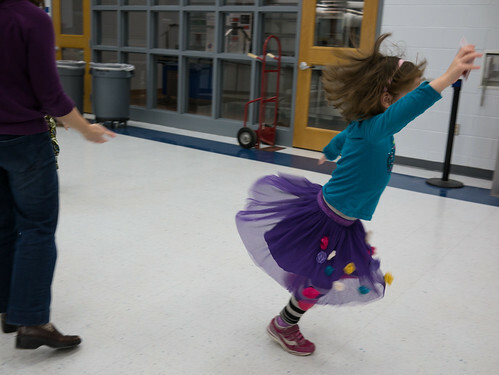 Leah, of course, is an expert in silly dancing. Silly dancing often leads to falling down. When I fall down, I'm usually not grinning about it. I guess it helps to be closer to the ground. After dancing to the same song a few dozen times in a row, it’s time for a rest. Believe me, I know. I was dancing with her for many of those times. At the end of In Summer, Olaf the snowman belts “In Summerrrrr”. This picture is Leah belting that part. When Leah threw her arms out, both Jen and I cracked up. 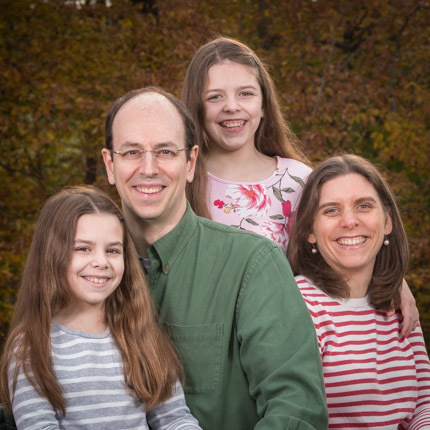 For the past several days, there have been very few moments when a song from Frozen is not being sung in our house (or at least bouncing around our heads). Between Do You Want to Build a Snowman?, Let It Go, For the First Time in Forever, Love is an Open Door, Reindeer(s) Are Better Than People, Fixer Upper, and of course In Summer, we've at least got some variety to our music. We were given a break from our extremely cold winter this weekend. Sunday it got up to the upper 50s, and Molly wasn’t about to let that go to waste. 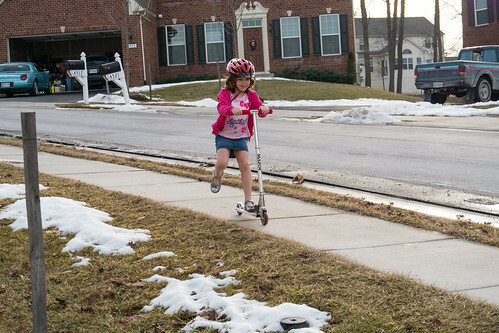 She finally got to ride her new scooter outside. Just ignore the remnants of snow on the grass and salt on the sidewalk. Jen and Molly also took advantage of the warm weather to wash Jen’s car. Since it lives in the garage (mine does not), it doesn’t even get rinsed off when there’s rain, so it’s been covered in salt and disgusting from the winter. But now it shiny clean. 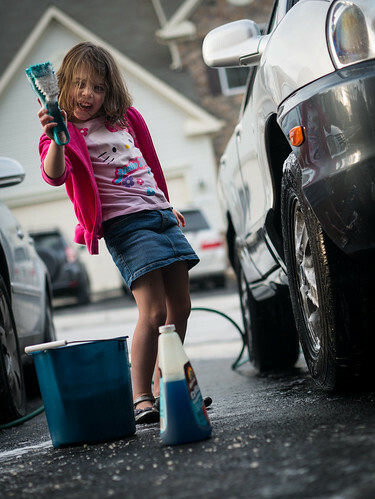 Who knew washing a car was such fun? Yes, Molly’s wearing shiny silver shoes and a skirt to scrub the tires. What else would you wear? Working so hard her tongue can’t stay in her mouth. Warm winter weather cannot last long. We ended the day under a Winter Storm Warning, and were told to expect 3-6 inches of snow the next morning. The snow never actually happened, but we were back into the 20s by the end of the next day.